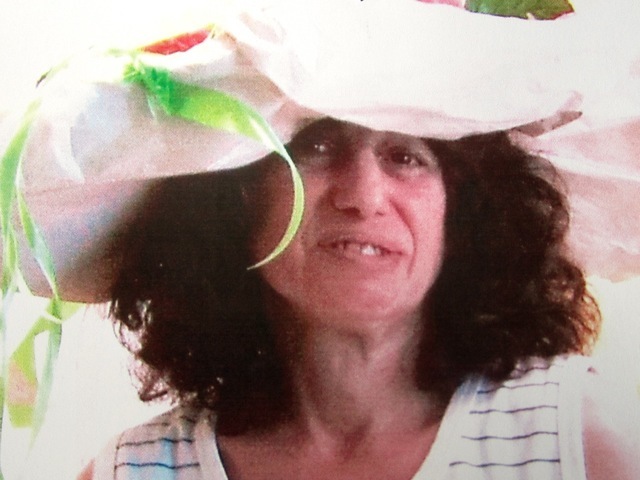 The truck driver who killed Jessica Dworkin in the West Village Monday morning was summonsed for failure to yield and failure to exercise due care, according to NYPD, but was not cited for possible violations related to truck size and safety mirrors. Dworkin, 58, was riding a foot-propelled scooter west on Houston Street just before 9 a.m. Monday when she was caught by the rear wheels of a flatbed semi whose driver, identified by the Post as Greg Smith, was turning right from Houston onto Sixth Avenue. Dworkin was dragged by the truck for two blocks, until witnesses were able to get Smith’s attention. She died at the scene. Dworkin, who also went by the name “Jessica Blue,” moved into 128 Thompson St. between West Houston and Prince streets from Massachusetts in the 1970s, said close friend Craig Walker, who knew her for more than 20 years. Talkative and warm by nature, the self-described artist regaled him with tales of writing for Interview and Details magazines, and frequenting Studio 54 in her younger years, he said. Photos from the scene seem to indicate that Smith’s truck exceeded 55 feet, the maximum length allowed on surface streets without a permit. The cab is also missing the required front-mounted crossover mirrors, which give truck drivers a view of what’s directly in front of them. An NYPD spokesperson told Streetsblog that two citations were issued: one for failure to yield to a pedestrian and one for failure to exercise due care, a violation of state vulnerable user laws. City Council Speaker Christine Quinn, who represents the district where Dworkin died, has yet to take a position on the Crash Investigation Reform Act, a package of council bills intended to compel NYPD to properly investigate traffic crashes that result in injury and death. This fatal crash occurred on the border of the 6th and 1st Precincts. To voice your concerns about neighborhood traffic safety directly to the commanding officers of either precinct, go to the next community council meeting. Details for the 6th and 1st precinct councils are available on the precincts’ web pages. To encourage Council Speaker Quinn to take action to improve street safety in her district and citywide, contact her at 212-564-7757 or @ChrisCQuinn. . . .Smith’s truck exceeded 55 feet, the maximum length allowed on surface streets without a permit. The cab is also missing the required front-mounted crossover mirrors, which give truck drivers a view of what’s directly in front of them. . . .two citations were issued: one for failure to yield to a pedestrian and one for failure to exercise due care, a violation of state vulnerable user laws. Ok, so, small consolation but the family should have a rock-solid (rebuttal presumption of liability wrongful death suit, right? Though, I’d think negligence leading to death should involve criminal liability. I’m assuming here 55 feet means the length of the trailer. I know for a fact 53 foot trailers are allowed on NYC streets. I see them all the time. I know this intersection is unsafe, but I bet the main factor in this poor woman’s death is the likelihood that the truck came flying down Houston at the speed limit of 30mph (or above), encountered the woman just as he was about to make the turn, passed her on the left side (probably didn’t even notice her), and then made the right hook just as he was slightly more than halfway past her. She likely didn’t even have a chance to react or dive out of the way. This is normal vehicular behavior to most people in this country. Just swing a turn at 30mph in the middle of a city as if you are a stunt driver on a closed course – what right does anyone else have to use the street anyway? Joe- I hope you’re joking about seeing them all the time meaning they must be legal? 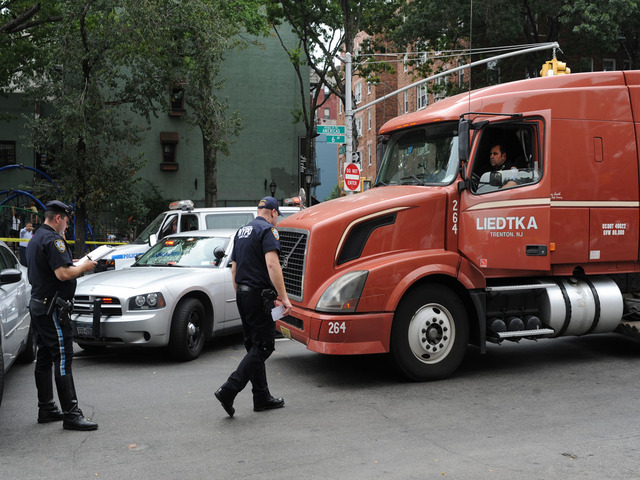 According to the Truck Access and Vehicle Dimension Guidelines for New York City on the DOT website, a vehicle with a 53′ trailer is not allowed on city streets without a permit, and they are only eligible for a permit if they have a non-divisible load. Same for any vehicle exceeding 55′ total length, bumper to bumper. Correct me if I’m reading it wrong. @8e087287ca32305264277fdf03c4bae1:disqus I’m not joking. There are 53 foot trailers parked at one of the local shopping centers right now. Note that this is Eastern Queens. Maybe the rules are different in Manhattan but I don’t think so. I see loads of 53 footers on Canal Street. I know there are certain streets where truck traffic is restricted, but on most arterials 53 foot trailers are allowed. My brother-in-law, who drives these things for a living, told me as much. Maybe “permit” is just a one-time deal? You get the permit first time you drive into NYC. After that you can drive the trailer in as much as you want. Trucks with 53-foot trailers may only travel on the portions of I-95, I-695, I-295, and I-495 that cross the city between the Bronx-Westchester County line and Queens-Nassau County line. 53-foot trailers carrying non-divisible loads must apply for a New York City Permit (pdf). Bottom line-48′ trailers are allowed on truck routes without permits if they’re carrying household goods. 53′ trailers need a permit, but I’m venture to guess the majority do without one and hope they’re not caught. BTW, I’m about 1/2 mile from the I-495 which explains the large number of 53′ trailers I see. I’ll bet they’re only one local streets for a mile or two, so they take their chances without a permit. Only 53′ trailers with “non-divisible loads” may be eligible for a city permit. Daily vs. one-time is not specified. Well, it’s clear this particular truck had no business being on city streets. Anyone want to bet it was just passing this way to avoid tolls? We now have yet another reason to reform the toll structure in this city. It shouldn’t be less expensive to go through Manhattan than to stay on expressways. Yes, quibbling over the alleged length of the truck obscures the more important issue here: the driver failed to yield and crushed a woman to death. 53′ trailers are not allowed on city streets, only on certain interstates, but from what I can tell this law is not enforced at all. The reality is that 53′ trailers are pretty standard everywhere else (where pretty much all of our goods come from), and if this law were seriously enforced, it would significantly increase the cost of goods in this city. Wow, not endangering women, children the elderly and everyone else in the City with huge trucks may “significantly increase the cost of goods in this city.” Well, we all know that saving a dollar makes it OK to kill people, right? Or maybe we’re killing people and not saving that much money. The extensive car-free zones in Dutch cities seem to have no problems. In any case, anyone who thinks that “cheap goods” is a legitimate excuse for the present carnage of the innocent is so lacking in a conscience that they have sharply departed from the most minimal standards of decency and humanity. I’m surprised that the obvious ticket wasn’t issued—lack of mirrors on a commercial vehicle. As for the restrictions on length, it only applies here because that truck isn’t carrying household goods (the green STAA exception) and is more than a mile away from an interstate. Although I’m a firm believer that tractor trailers don’t belong on city streets, and that trucks that are operated in the City should be redesigned to provide better visibility, most Streetsblog readers know it doesn’t take a 53 foot tractor trailer to kill a pedestrian. SUVs kill pedestrians almost every day of the week. Bottom line is, this is a very dangerous intersection with traffic turning in too many directions. One quick and easy fix would be to have a “pedestrian only” signal, so that those on foot or human powered vehicles could cross whichever way they want, without fear of turning traffic. Thank you for including details in this article directing people how to “complain effectively” about unsafe streets and intersections. Little do we know that we can actually affect the budget and prioritization of DOT capital projects through a little advocacy work.I just hate how it takes an injury or fatality to galvanize us. Drivers in this town NEVER understand that when they are turning left or right onto a street, that pedestrians have the walk sign for that street. They get as close as possible to you and some even honk like you’re in the way. Learn how to f*cking drive. Don’t say never, I am very respectful of pedestrians and cyclists and wait for them without crawling right on top of them. Of course I am the exception rather than the rule, and I agree that driving culture in this city (and beyond) is terrible. That said, it should be noted that pedestrians will often stand in the street rather than on the sidewalk when waiting to cross, and will often stand as close as possible to moving traffic, and will sometimes run to jaywalk in front of oncoming traffic. Yes, drivers present the danger, not the pedestrians, but pedestrians standing on the edge so to speak just increases the risk. It also makes close interactions between drivers and pedestrians a routine occurrence. The catch 22 is that the slower you go, the closer people will get. If someone runs to jaywalk in front of you and you slow down significantly, others will simply start to cross in front of you. If you turn slowly, pedestrians will practically walk into the back of your vehicle so they can cross at the precise second that the vehicle is clear. Drivers are definitely a problem, but they should not the only ones who should be expected to behave responsibly and with prudence. F**k the 2 violations Greg Smith received after killing Jessie Dworkin. What about the fact that his huge flatbed tractor trailer was in the lane adjacent to the curb on Houston Street when he was making a right turn onto Sixth Avenue, hence, being culpable of vehicular homicide. pedestrian injuries and deaths at that dangerous intersection. to the city that the intersection must be made safe for pedestrians. I lived across the street from Jessica in the late 70s and 80s. She was one a kind, a fixture on the downtown scene. In the early 90s she spent hours with my dog while I was at work. I can still remember running into them. “Dance Buffy, dance for Joey Arias,” Jessica was saying, as she talked to the downtown diva. Rest in peace, gentle soul.